Kevin McAlpine, who had just passed his driving test when he caddied for the first time at Kingsbarns to earn some extra pocket money, has high hopes of steering world No 2 Lexi Thompson to a top prize worth just under £400,000 in the Ricoh Women’s British Open on the Fife course over the next four days. 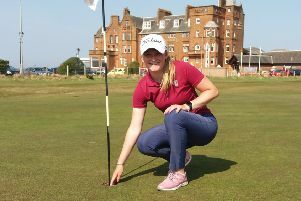 McAlpine, an ex-Scottish Amateur champion and the son of former Dundee United goalkeeper Hamish, has struck up a successful partnership with the 22-year-old American, who has recorded a win and four second places in 11 events since the pair started working together in March. That spell also included Thompson being reduced to tears after she was hit with a four-shot penalty over a ball-marking incident that was reported by an armchair viewer and contributed to her losing out in a play-off in the season’s opening major, the ANA Inspiration at Mission Hills in California. However, McAlpine, who picked up Thompson’s bag after joining a group of fellow Scottish caddies at The Old Collier Golf Club in Florida, believes his boss is well and truly over that “unfortunate” incident and sees no reason why she can’t get in the mix in this week’s £2.5 million event on the Fife coast. McAlpine, who holds the St Andrews Old Course amateur record after carding a 10-under-par 62 in the qualifying rounds for the 2004 Amateur Championship, is hoping he can help give Thompson, who first showed a glimpse of her potential when she qualified for the US Women’s Open at the age of 12, an edge over her rivals this week through knowing the Kyle Phillips-designed course like the back of his hand. “I’ve seen a lot of this golf course, believe me,” he declared, laughing. “I was still at school when I did my first summer here. I’d just passed my test and I’d come down once or twice a week to earn some extra pocket money. When I first turned pro, I went to the States for the winter then came back here to work in the summer and I had four summers here. In fact, it was only two years ago that I stopped working here as I was still trying to play myself then on the PGA EuroPro Tour. McAlpine, who has used the trip home to spend some time with parents in Newtyle, north of Dundee, is set to be in the US camp, of course, in the forthcoming Solheim Cup in Des Moines, the same position Ricky Elliott, the Irishman who caddies for US Open champion Brooks Koepka, found himself in at last year’s Ryder Cup at Hazeltine. “The Solheim Cup will be interesting,” said McAlpine, smiling. “I love match-play golf and it is one of the biggest team events in the game.